In 1972, Clayton was working in a lumberyard when a piece of wood broke off the sawmill and struck him in the head. Surgeons were forced to excise a fifth of his frontal lobe—the area of the brain that controls judgment, inhibition and impulsive behavior—to remove shards of bone that had pierced deep into his brain. The accident had a shattering impact on Clayton’s life. The former devoted husband and father developed severe memory loss and began to suffer from hallucinations and paranoia. A quarter century later, Clayton was convicted and sentenced to death for the 1996 murder of a Missouri sheriff’s deputy. He remained on death row for nearly two decades as his appeals worked through the legal system. Numerous psychiatric exams revealed that the condemned prisoner had diminished intellectual capacity, social functioning deficits and dementia. But Missouri authorities were determined to see this intellectually disabled man put to death, despite his inability to comprehend “the nature and purpose of the punishment about to be imposed on him,” as required by Missouri law. Clayton’s attorneys’ pleas for mercy fell on deaf ears. The Missouri Supreme Court denied his right to a competency hearing, Governor Jay Nixon (the same man who ordered out the National Guard against protests in Ferguson, Missouri last year) denied him clemency, and the US Supreme Court denied a last-minute petition for a stay of execution. March 2, 2015: Kelly Renee Gissendaner came within hours of death for the second time in less than a week when her “execution team” in Georgia said the drugs to be used in her lethal injection “appeared cloudy.” Gissendaner, who had only an indirect role in the murder for which she was convicted, clearly turned her life around in prison. Her new execution date has yet to be scheduled. April 29, 2014: Clayton D. Lockett suffered an agonizing execution after being injected with an untested lethal concoction of three drugs. The Oklahoma death row inmate shook uncontrollably, gritted his teeth, and mumbled 15 minutes into the gruesome procedure. Authorities called off the execution, but Lockett died 45 minutes after it had begun. Millions of people in the US and internationally have been rightfully shocked and outraged by these horrifying spectacles repeated time and again on America’s death row. But the overwhelming response of state authorities, the courts at every level, and the federal government is to do whatever is necessary to keep the state-sanctioned killing machine in operation. The death penalty is defended at the highest levels of the government and the judiciary, from the Supreme Court to the Obama administration and both big-business parties. 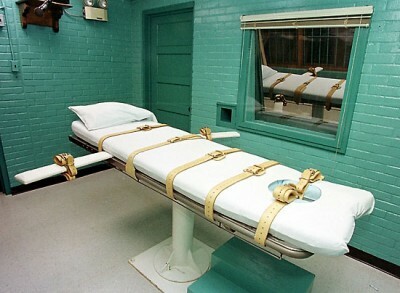 Since the US Supreme Court reinstated the death penalty in 1976 after a brief hiatus, it has consistently ruled to uphold the constitutionality of capital punishment. While ruling the execution of the intellectually disabled and those sentenced for crimes committed as juveniles unconstitutional, the court has repeatedly upheld the death penalty itself. And despite the ruling barring execution of the intellectually disabled, the justices have rarely halted an execution on this basis. Indeed, in the killing of the clearly mentally disabled Clayton, one senses that the state decided a certain principle was at stake: the principle of unlimited and unchecked power. It killed because it could, and wanted to make clear that it would. The barbaric practice of capital punishment is only one expression of the violent and criminal character of the American state. Police officers who kill unarmed people are immune from prosecution, while America’s prisons are packed with two million human beings, more than any other country in the world. These are all symptoms of a deeply diseased society, corrupted through and through by social inequality and the aristocratic principle that the wealthy and powerful can do whatever they want, while the poor and powerless are to be humiliated and degraded. Reading these words, one can envision the black-robed Supreme Court Justices as they deny stays of execution, the governors who refuse to grant clemency or pardons, and the execution teams in prisons injecting concocted lethal mixtures into the condemned veins. One can also picture President Obama in the White House situation room drafting his “kill list” of those targeted for drone assassinations. The opposition of Jefferson and Madison to capital punishment was based on the Enlightenment principle of hostility and opposition to arbitrary state violence, which was associated with the Ancien Régime and the feudal aristocracy of Europe. Some two-and-a-half centuries later, the current political establishment’s support for state-sanctioned killing speaks volumes about the decayed state of class rule in 21st century America. The criminal character of the state is an expression of the class whose interests it represents: the corporate and financial oligarchy, whose wealth is derived from swindling and speculation, standing on top of a society riven by historically unprecedented levels of inequality.